Get two sophisticated looks for the price of one with this feminine removable ankle strap wedge. 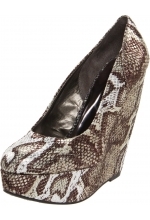 This wedge is super feminine and wearable with almost anything. Available in Pink and also in Kiwi, you can bring a bit of spring into this winter. The shoe features a synthetic suede upper, removable ankle straps, 13cm heel and 2.5cm platform, leopard print cushioned insole and a rubber outsole.